From custom fonts to ad-hoc font families you assemble out of a variety of individual faces, CSS 3 gives you more typographic options than ever before. 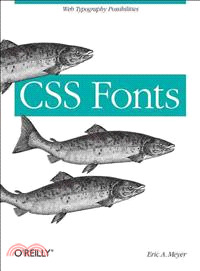 This concise guide shows you how to use CSS properties to gain a fine-grained and wide-ranging influence over how you display fonts on the Web. Short and sweet, this book is an excerpt from the upcoming fourth edition of CSS: The Definitive Guide. When you purchase either the print or the ebook edition of Fonts, you’ll receive a discount on the entire Definitive Guide once it’s released. Why wait? Learn how to choose and manipulate fonts right away.